Anthony Alfaro is the rookie head coach at Cristo Rey Brooklyn H.S. A familiar face is back in the Catholic school ranks. 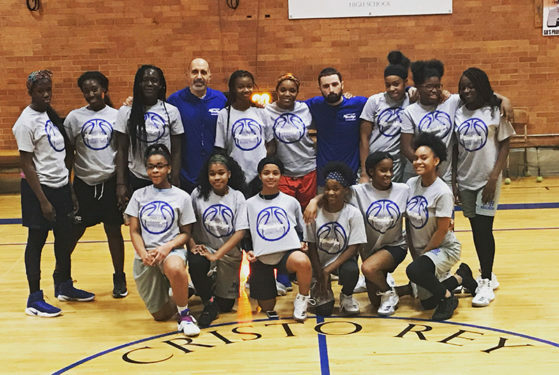 Anthony Alfaro, who coached the women’s basketball team at LaGuardia Community College, Long Island City, for the past four seasons, has taken over as the girls’ varsity hoops coach at Cristo Rey Brooklyn H.S., East Flatbush. A native of St. Joseph’s parish, Astoria, and a current resident of Hollis Hills, Alfaro spent nearly 20 years coaching multiple Catholic Youth Organization sports at American Martyrs parish, Bayside. After several coaching stops in the GCHSAA and other area institutions, he settled in at LaGuardia. Prior to this season though, both the men’s and women’s basketball programs at the school disbanded. Cristo Rey Brooklyn Athletic Director Matt Kenny sent an email about a coaching vacancy to local college coaches, which wound up being passed along to Alfaro, who interviewed for the job and was a perfect match based on his Catholic school past. He has already been implementing what he learned at LaGuardia into the Panthers’ program, which is one varsity team made up of girls from all four academic years. The team competes in the GCHSAA’s ‘B’ division. Since tryouts in early November, Cristo Rey Brooklyn has been coming together as a team. Alfaro described his players as very respectful, structured and eager to learn, which makes his job much easier since he doesn’t have to spend time on discipline and can instead focus solely on basketball. “Once these kids bought in…from where they were when we first started seeing them in open gyms in October to where they are now, it’s amazing to see the progress these girls have made in such a short amount of time,” he said. Alfaro has delighted in the fact that his high school players genuinely want to learn more about the game. He said at the junior college level, sometimes it was more of him convincing his players of what they should be doing rather than his players seeking to get better on their own. The goal of this first season is to build structure and competitiveness with the program. Alfaro’s assistant coaches, the school’s admissions director Luis Posada and former Italian professional basketball league coach Marcelo DiRusso, have provided tireless support in helping to achieve this mission. “Being with this guy (Alfaro) is like being in a classroom… being in a basketball classroom,” Posada said. “I’ve learned a lot about how to teach the game and even how to manage people better. He’s a great and knowledgeable basketball coach, so I’ve learned a lot in that regard. In just a few months, Alfaro has already developed a strength-training program for his team members and has set up weekly study hall sessions. At Cristo Rey Brooklyn, students work a day in the real world each week, so while the basketball team loses them for practice that day, they’re able to gain valuable experience that will help them down the road. As for basketball, Alfaro said he has been pleasantly surprised with how quickly the team has progressed this year. The girls have been asking for more gym time and for the coaches to come earlier and stay later at practices so that they can keep improving. We’ll have to wait and see where that progression leads the Panthers when the dust settles after this season. Either way, Alfaro looks forward to each day he gets to work with the talented student-athletes – both on and off the court. As the old saying goes, when you love your job, it’s not considered work. That’s certainly the case for Alfaro, who considers every day with his team its own individual adventure.